Orchard Park's Peter Meindl just completed the most successful cross-country season ever by a Western New York high school boy. 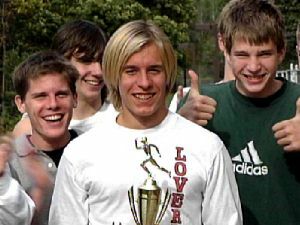 He set new course records at McQuaid, Alden, and Elma Meadows and won the McQuaid Invitational, Sectionals, the New York State Championships and even the Foot Locker North East Regional Championships. The big prize was a chance to compete in the Nationals in Florida. Only three other boys from the area have ever done that. As soon as my outdoor season was complete I began to focus on the upcoming cross country season. It was an extremely disappointing season if you go by times alone, however, I feel that considering the conditions of the races in which I competed in, I raced quite well. Still, I had much to prove to myself, and to others. The footlocker championships was five months away. I knew that in order to compete for the national title some things would have to change, and everything would have to go just right. During my two week break between seasons I formed my training plan for the year, set my goals, and changed my diet slightly. When I began running I came back slow, doing easy thirty to forty minute jogs each day. Gradually I increased my mileage until finally I had reached about seventy to seventy-five miles per week (this is approximate, because I run minutes, not miles). When school started I had gotten into a routine of two workouts per week, weights three times a week, and morning runs on Mondays, Wednesdays, and Fridays. I had run two races, The Mud Run, and the Toy Fest 10k. At this time I began to slowly bring my mileage down a bit, but it leveled off around sixty to sixty-five miles per week. The season officially began for my team at the East Aurora Invitational, however I did not have enough practices because I had been out of town for a few days looking at colleges. I had not run a race for almost a month, so my coach Pete Holowka and I decided it would be good to get in a race before the McQuaid Invitational which was the following week. We chose the Linda Yalem run. It went well. I felt good, not as relaxed as I had hoped, but that was probably from the lack of racing. The next week in Rochester I had the fastest time at McQuaid, but I felt terrible throughout the race. My legs felt like lead. At the time I was beginning harder training so I was not worried. Throughout the remainder of the season I stuck to a schedule of racing every other week, not including duel meets. When it was time for States I felt great. My confidence had been shaken a little bit by a bad race at sectionals, but that was due to my training as well. During the week of states I ran my last hard workout on the Wednesday preceding the race, and then ran forty-five to fifty minutes easy for the next two days. This rest paid off; I felt extremely comfortable during the entire race. After States I trained very hard for the next week and a half, but did take a couple days easy before regionals. At Van Cortlandt Park I went out with the mind-set of first, qualify, second win, and third, get the record. I had a dream two nights before that I didn't make it back to Florida. Even when the gun went off I was worried about not making it back to Florida. If that had happened the car ride home would have been terrible for my teammates. Luckily it did go well, and I came out of the race more confident than I have ever been before. This confidence continued through the two week break between regionals and Nationals. My workouts were the best of the year including 1600m intervals with two minutes rest in between we do a lot of these threshold type workouts). I ran my first four in 4:40-4:42 and my last in 4:31. Also, my speed workouts had been going very well. When I arrived in Florida I was instantly hit with the heat and humidity. When I ran that evening, around 4:30, I could barely stand it. The next morning at the golf course was even worse. At 9:00 it was already around 75 degrees, and the humidity was almost unbearable (at least to me). I hate the heat. When I arrived in Florida I was instantly hit with the heat and humidity. When I ran that evening, around 4:30, I could barely stand it. The next morning at the golf course was even worse. At 9:00 it was already around 75 degrees, and the humidity was almost unbearable (at least to me). I hate the heat. The entire weekend was a great experience, just as it was last year. Although Nike was the sponsor this year and not Adidas, the athletes still got a lot of cool stuff, and unlike last year, many very elite athletes followed us everywhere we went. Soon after arriving on Thursday at my hotel I went to a room where I received my uniform and some other stuff. Also in the room were tapes of all of the previous twenty-one national championships. I watched these for a while. It was cool to see what some of the best distance runners in America raced like when they were my age. When I was done with this I got my room assignment, and learned that my roommate would be Milos Metric. Milos is a Yugoslavian exchange student who is now living in North Carolina. Despite finishing third in last years European Championships in the 5k (for 17 and under), Milos was the final qualifier in the South, finishing 8th. He told me after the race that he had not cared about the Regional meet, he trained through it. In Florida he finished 6th, running a strong race from the front. That night, after my run, there was a beach party outside of the hotel. There, all of the high schoolers met the Nike Athletes for the first time. Some people danced, and others competed in a hoola hoop contest. It was pretty funny to see people like Bob Kennedy, Regina Jacobs, Suzy Hamilton, Stacey Dragila, Abdi Abdirahman, and Mebrahtom Keflezighi hoola hoop. Abdi was the worst; I have no idea what he was trying to do, but he wasn't hoola hooping (I wish I had gotten pictures of this, it was funny, but I forgot my camera in the hotel) The final competitors were Suzy Hamilton and some girl from the south. The girl won, she could have gone on forever. After the party/dinner we went to The Magic Kingdom for the fireworks show and some snack bar thing. The cookies looked good, I didn't have any though. Here I talked to Abdi. He told me about how he got started running, and when. According to him he began in his sophomore year of college. His first 5k, after a week of running, he ran 15:05, but lost to someone from the cross-country team at his junior college. He was upset that he got beat, and he joined the team. A month later he ran 14:30, and within a year he was competing on the national level. He is now twenty-three years old and one of the best distance runners in American history. The show was pretty cool, I guess. Afterwards we returned to the hotel, sat around talking for a while, then went to bed very early. The next day we got up around 7:30 and went to the course. After we all walked through it with officials, media, and the Nike athletes, we were free to run on our own. Around this time Michael Johnson arrived. I hate that course. It is not a cross country course. It is unbelievably flat, with one or two small bumps in it that the race directors called hills. Still, the run was difficult. I ran quite slow, however afterwards I was feeling very lightheaded. Although I had been hydrating all week I decided after this to drink more water than I ever had before, which caused me to go to the bathroom constantly, it was so annoying. After everyone was done with their runs we headed back to our rooms to shower and eat lunch. Then we went back to The Magic Kingdom to take part in a parade. It sounded cool, but it sounded cool last year too. I hoped that it would be different, however it was not. Nobody there really knew who we were, or why we were in a parade with Mickey and Minny. They just stared at us the whole time and looked pretty upset, but we kept waving like idiots. When this was finally over with we went back to our rooms once more and relaxed before dinner that night. At dinner we were free to ask the panel of Nike Athletes any questions that we wanted. Although I did not ask anything, some kids at my table had some very good questions to ask. Not Bobby Curtis though. Well, it was a decent question, but he should have known that Michael Johnson wouldn't want to hear anything about Maurice Greene, especially "who is the fastest man alive, you or Maurice?" Although Bobby Lockhart was dying to ask him about his previous comments about how nothing above 1500 meters should be an Olympic sport, he did not. It would have been pretty interesting to see Michael's response. When dinner was over, all the high schoolers were invited to get autographs from the Nike Athletes, however, I passed on the opportunity, along with Mint Henk. We took thirty bottles of water between the two of us (well it was somewhere around that, we counted but I can't remember now) and walked to our rooms. A little side note: Mint is the funniest person that I have ever met in my life, and if he is never on Saturday Night Live it will be a shame. That night I slept quite well, however both Milos and I had to wake up numerous time because of the amount of water that we drank. Although I had not felt nervous at all at any time during the trip, when I woke up on Saturday it hit me. For hours before the race I was so nervous that I could not stop my hands from shaking. This worried me a little bit because I had never been this nervous, but I thought that this nervous energy could actually be useful towards my running. We arrived at the course around 8:00 and sat in our region's designated area. The weather was very nice at this point. It was a bit warm but there was a cool breeze, and it was very cloudy. However, as my race grew nearer the weather became increasingly worse, or better, depending on how you were looking at it. To me, it was getting worse. The sun was now shining, and the wind was gone. It was very uncomfortable, with temperatures in the high 70's. The time before my race went by quickly. The girls race began around 9:30, and I decided that it was time to warm up. After all of my drills were complete I was told to line up with the rest of the kids from the Northeast, and one by one we were called to the starting line. As the official called out our final instructions I looked down the line at the rest of the runners. I knew that there was nobody there that I could not beat. The gun went off and the kids shot out like I had only seen once before, last years championship. However I felt a difference. As a first time competitor, it had worried me that so many people had gone out so quickly. Although I knew that the pace was not going to remain so fast, it was a bit overwhelming to have to run so quickly just to remain in the middle of the pack. This year I stayed relaxed, stuck in the last third of the pack, and very slowly worked my way up. Although Billy Nelson from the west region had taken the race out in what seemed like an extremely fast first 800 meters, by the mile it had slowed to 4:40. At this point I was in about 10th place, but was moving up with every stride. This continued through the 1.5 mile mark, around where I ran into a post with my right arm. Although I can barely remember this happening, it was not a big deal at all, a kid in school reminded me of it after he had seen the race on television. When we went through two miles I was in about 5th or 6th place, but only a second or two behind the leader, Tim Moore. Very slowly now, I cut down the lead. Through 2.5 miles I was still only in 4th place, but Moore, Lockhart, and my tiny roommate Milos, were only meters ahead. It was at about this time that I realized that I had an excellent chance of winning. The race had unfolded exactly how I had hoped it would, and with around 700 meters to go I knew that it was time to start my finishing kick, and put the competition away before it came down to an all out sprint. I went. I passed Milos for third place, but then somebody kicked my heal with their shoe and I stumbled. Although looking back it was nothing big, at the time it seemed like everything. I had been uncomfortable throughout the race. The extreme humidity suffocated me. I was very tired, and it only took a small thing like being tripped up to throw me out of the race mentally. As the finish line came closer and closer, more runners passed me. When I had finally finished, I was very dizzy and could not walk. My legs had given out on me just when it seemed, at least to me, that I was actually going to win the National Championship. It was sudden, very sudden, but it did not come as a huge surprise to me, fore it was not the first time something like that had happened. The first time was at the Empire State Games after my freshman year. I was running in the 1500 meter run. I was not expected to do very well, but with about 200 meters left I was in the lead. Then my legs practically stopped. With 100 meters left I was passed by second, then third, and I had to basically walk the last 20 meters. That day it was extremely hot, and very humid. Chances are that the weather was not the only factor involved in me losing this race, however I do feel that it had a bit of an unfair affect on all of the kids from the Northeast. This shows by comparing the times from Regionals to Nationals. Many kids actually ran slower at Nationals on an extremely flat, fast course, than they had only two weeks before at Regionals, on a pretty tough course, on a soggy day. All this being said, I did lose, and Tim Moore was the better runner that day. Although I am disappointed with the results from Florida, I am already looking forward to the outdoor season. I have always thought of cross country as preparation for track, and I know that this year I am very well prepared. Soon after the race I decided that I would focus on the 1500m-1600m-mile instead of the 3200m-2mile. Although this is what I trained solely for during my freshman and sophomore years, last year I gave the 2-mile a try. This experience has caused me to believe that the mile is my main event, and my future. If you get a chance, come out and watch some meets this spring. The competition as a whole is improving every season in Western New York, so it will be worth your while. As for me, June will be a very exciting time. Peter Meindl and his Orchard Park team mates after being named the top Super-7 Athlete of the Week (Oct-11-2001). 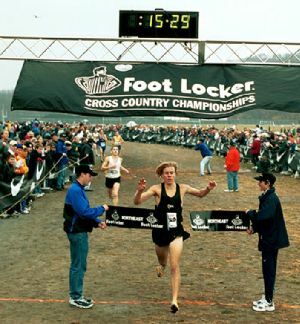 The 2001 Foot Locker North East Regional - Peter Meindl leads the best of the best from all the states in the North East.